When making a boutonnière it’s important to consider the ingredients you will use. 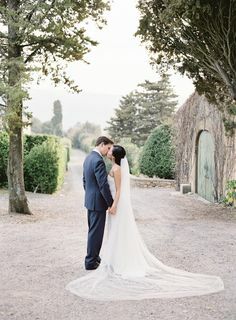 Depending on the aesthetic of the wedding and the grooms attire, the boutonnière should be a nice compliment and accent to the other existing elements. Step 1: Gather your ingredients. A good rule of thumb is to have at least four textures encompassing three elements, the backing, the texture and the focal flower. For this boutonnière, sage was used as the back leaf, snowberry and acacia for the texture and ranunculus for the focal flower. 2. Prepare your focal flower. The focal flower needs to stay strong throughout a day filled with pictures and a night of dancing. For a flower like ranunculus, wire the stem by inserting the wire straight up through until it pokes just barely into the head of the flower. Trim your wire to the length of the stem. 3. 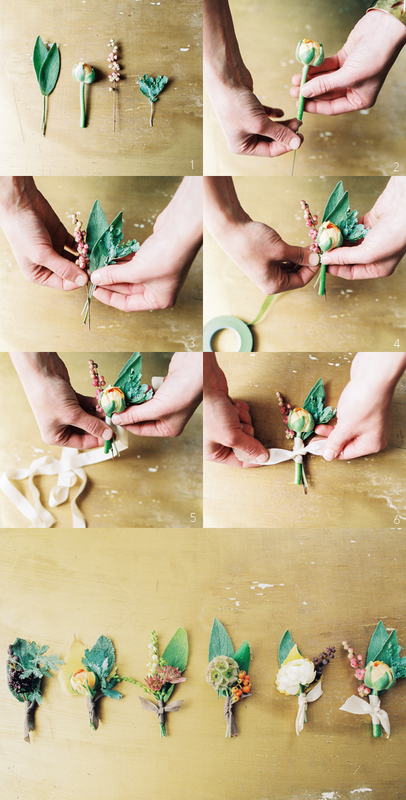 Place your back leaves together to start making a miniature bouquet. Place the textured elements on next and stagger them a bit so everything isn’t at the same height. 4. Next place your focal flower in the center and use floral tape to tightly wrap the ingredients together. Leave the bottom of the stems exposed by just wrapping the tape about three times tightly and tear off the excess. 5. Pick a nice neutral ribbon. There are lovely silk or organic cotton ribbons to choose from. Tie a simple knot and trim off the edges. You can also wrap and hot glue the ends to the back to have a clean and simple look. Thanks so much for the feature Once Wed! Incredibly gorgeous work from two of my absolute favorites! These are just lovely! Darcy’s work is always gorgeous. Oh thank you Once Wed for such a lovely feature! It has been such a pleasure to work with you! oh how I love D’Arcy’s photography!! 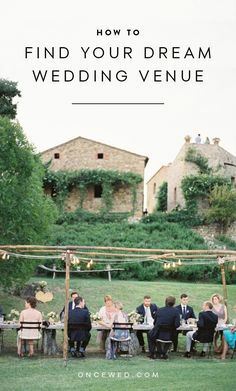 And this is a great feature… something everybody in the wedding side of things needs to know and often doesn’t. Wow, I absolutely love it. D’arcy’s pictures are amazing. What beautiful photographs! Thanks for the tutorial. I love these ideas! I wish I would have seen these 6 months ago! Beautiful! Gorgeous pics. 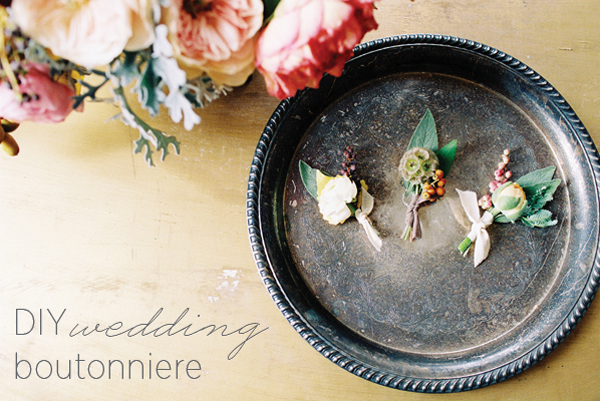 Boutonniere making is such a lost art–it can add so much to a wedding. It’s all about the details! I like how they used sage. 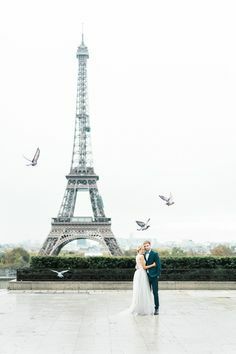 Lovely lovely images!! and great tutorial! What elegant boutonnieres! 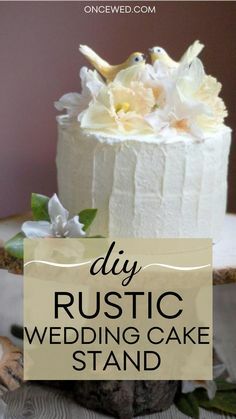 These step-by-step pictures look simple enough and the photos of the finished products look so beautiful that they make me wonder why I’ve been paying florists. 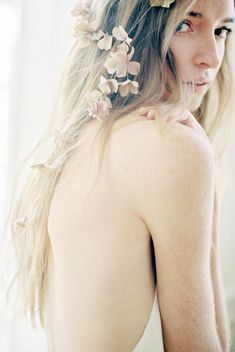 D’Arcy, beautiful images as always! And to Tinge Floral, we thank you for the very helpful guide for a fun DIY wedding project and your lovely selection of flowers. Really enjoyed this post! 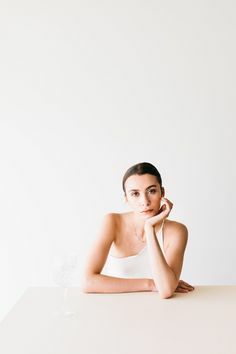 Gorgeous photography and very helpful article! There’s nothing like a photo-step-by-step guide to show you how it’s done! Thank you! Simply Gorgeous! D’Arcy and Ashley are two shinning talents. I love those. They are so pretty ! LOVE LOVE LOVE. You are so amazing Darc! Gorgeous. And they look so easy to do! 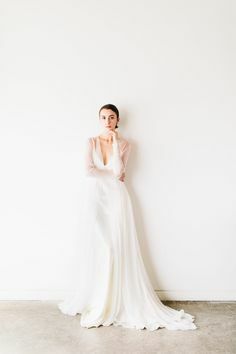 This simple wedding inspiration shoot with feminine style was created as part of a photography workshop, and there's plenty of beautiful ideas to be found here by brides-to-be!